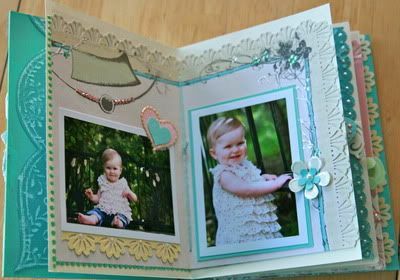 Spellbinders Blog Hop this week! Welcome to the Core'dinations and Spellbinders Blog swap!! Are you ready for a week long blog swap filled with loads of inspiration? Well, you came to the right place. Spellbinders and Core'dinations have teamed up and created gorgeous projects just for you. But...a blog swap wouldn't be the same without give-a-ways, right? Insert your project here and whatever details you can give them about how you created it...the more the better. Seriously if you aren't leaving your name on all these places, I think you must be crazy. teehee. I love the CORE products, don't you? So this week I am showing you my little Sarah box. I made one for Ireland earlier thisyear, and had intended to put a mini album in it of her...but it became her little purse. She loves it so much that I don't want to use it for anything else now. But when I received some fabulous pictures of my niece Sarah. I knew that the perfect little mini album was one that would be contained in her own "purse". 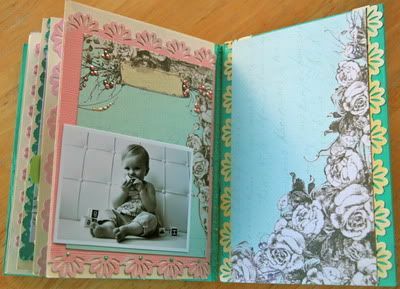 I used Spellbinders products & Core'dinations throughut this entire little mini album. And I LOVE the outcme. Surprisingly, it wasn't colours that are "me", but for sarah's 1 year birthday party last week I made her an album and had lot's leftover, so I created a couple pages and this project. Hope you like it. I started out by painting the entire outside & inside of the box. Lavendar outside (Kaisercraft paint) white inside. Then I ran the white brush over the outer edges of the box to make it look a little distressed. I did paint some of the metal fixtures lavendar & white, knowing full well some would wear off and some would stay on. I like that weathered look. I adhered the Core Impressions Basic Grey-Ornate line down on the box with Scrapbook Adhesives- Adhesives sheets. (super handy sheets I tell you!!!!! I used them for my flowers too and because I did a lot of punching on the edges of paper, these sheets are the most perfect thing for adhering them down! You can't see, but I did use a spellbinders circle die to create a base for this lacy part. I wanted to stay within the circle and it was a good guideline. 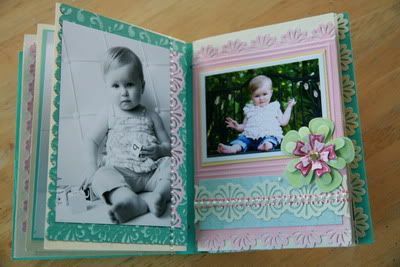 The layered rectangle dies are PERFECT for matting photos. I just didn't emboss them cause I knew you wouldn't see it anyways. I used these throughout the whole album. It was perfect since I made up quite a few mini pics. This purse is so deep that I put all the leftover pics that I made up in the bottom. I made extra mini, 4x6's and 5x7's for future design projects, and my parents album, etc. I am stoked because now when I am looking for a picture of this precious peanut, I just need to look in her purse. As you can see I did incorporate quite a few punches in this album. I didn't have any "edgeabilities" but if I had I would surely have used them to crete the same type of look. be still my heart. I adore those. but I did have fun with the flower dies. I have a little room to do the journaling. That is always important! Something you may not think of when you create mini albums is to include the photo cd. But with these FANTASTIC Scrapbook Adhesives by 3L Photo CD pockets, you will never lose your photos again! I LOV that you can decorate and personalize them. 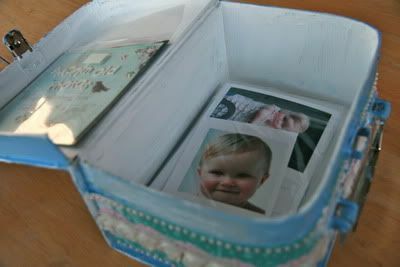 (I find that while you may back up your photos on an external harddrive, this is such a handy storage too in case anyone ever asks you to borrow the cd. CROP & CREATE IS ALMOST HERE!!! Before I get to today's LONG post, I must say, that I am in the groove of singing as loud as I can, music is cranked, 3rd qurter of income tax is ready to go to the accountant, 1 load of laundry left, I am having a FABULOUS Monday. Hope you are too! I am really really getting excited! The very first Crop & Create event is going to be here just around the corner. ALL INFORMATION ABOUT THIS EVENT CAN BE FOUND HERE. I don't know about you, but I get sooo inspired when I take fabulous classes, meet new people, get a chance to see cool things. It makes me feel rejeuvenated and want to scrap more and get those memories documented! I don't know how many times I've said it before, can you believe the talented teachers we have coming to SASKATOON?? i can guarantee this has never happened before to have this calibre of teachers in Saskatoon at one time! Have you seen the sneak peeks from the teachers? I will show them here in case you haven't had time to slide by Scrapbook & Cards Today website. I will do a quick review of the teachers, the class descriptions and the sneaks. We do have a few spots open in the classes for any last minute registrations. We'd love to have you!! Are you that scrapbooker who collects sheet after sheet of beautiful patterned paper but has no idea how to mix them together on your scrapbook pages? Are you too afraid to cut into that gorgeous sheet of paper for fear that you won’t be able to “make it work?” Does the idea of using even more than one sheet of patterned paper at a time completely freeze your scissors in mid-cut?! Well, fear not—this class is just for you! Join our patterned paper expert, Kelly Goree, as she takes the mystique and mystery out of using those papers once and for all. In this class you’ll create two double-page layouts that will teach you the fundamentals that will have you mixing up patterned papers as easy as 1-2-3! We all hunt for those cherished tried-and-true recipes that not only make our lives easier but make us look like we’re Martha Stewart to boot! It’s those favourite go-to basics that save us time and stress in the kitchen and it’s no different when it comes to our scrapbook pages! Join Kelly Goree for a fabulous "scrapbooking baker's dozen!" Well known for her bold use of color, pattern and design, Kelly will teach you how to take your layouts from delicious to extra-yummy with twelve basic design tips! In this class you’ll learn about techniques such as the “rule of thirds” and “focal photos” while you create three fantastic layouts guaranteed to be a hit with those you love! This girl ROCKS this industry with her clean and classic style. Most known for rocking the cards or maybe for her chart topping books. Yep, she has just finished her latest book, so that will be excited when it comes to print. I know I am putting all her bestseller books on my Ipad so I can take her everywhere. Her books can be found at Amazon.com (in hard copy) and Itunes for the tech saavy girl! I have met her at CHA and she really knows her stuff. I CANNOT wait to lear from her card classes. For anyone who knows me, making cards doesn't come naturally. I take longer to make a card then a layout. Much more thought. So I would love to walk away with more confidence and ideas on how to create magnificence on a small scall. Can't wait Kimber!!!! Here are the covers of her books if you are on a hunt for them! Flowers CAN bloom all year! Flowers can bloom all year long and they don't require watering or even a green thumb! 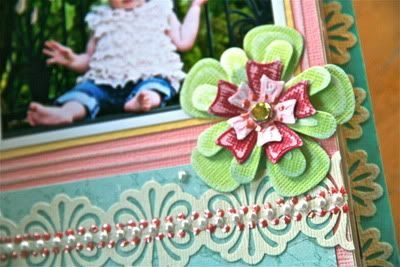 Join Kimber McGray and create a garden of blooming embellishments made from different mediums such as fabric, ribbons, zippers and yes, papers, too. In this class, you will make four fabulous cards adorned with beautiful, hand-made flowers, as well as two floral lapel pins perfect for any occasion. Bring your garden indoors and watch it bloom! Sponsors: Jillibean, Core'dinations, Maya Road, Stampin' Up! Christmas is coming card class! No matter who makes your "Naughty and Nice" list this year, they will be thrilled to receive one of these handmade cards! It's never too early to get a head start on holiday cards and these little gems are sure to be a hit. From gift card holders to snow globe shakers to cards that pop (up! ), join Kimber McGray for terrific card-making class filled with tricks and techniques right out of Santa's workshop! Sponsors: Jillibean, Core'dinations, Stampin' Up! If you have ever wondered how to interpret sketches you see THIS IS THE CLASS FOR YOU!!!! Love sketches? Then join Becky to create a fabulous two-page layout based on one of her favourite PageMap sketches! Students will learn terrific techniques and time-saving tips, and walk out of the class with a fantastic multi-photo page. But that's not all! With the leftovers, you'll also create a beautiful greeting card based on one of Becky's favourite CardMaps, perfect for any occasion. Canada's favourite scrapbooker. She is that instructor that everyone loves. Her style is timeless, beautiful. Her teaching style is efficient, classes are PACKED with goofies and you never get stressed. She really makes you feel good in her classes and you walk away with amazing projects. She is returnig to Saskatoon for the 3rd year in a row with a track record of sold out classes, we are proud to say we did create larger class sizes to accomodate more people. I am proud to say she is one of my best friends in this industry, LOVE LOVE her quirkyness, her eye for design and photography and just her personality. Always the best laughs ever!!!! From beginner to advanced and everything in between! 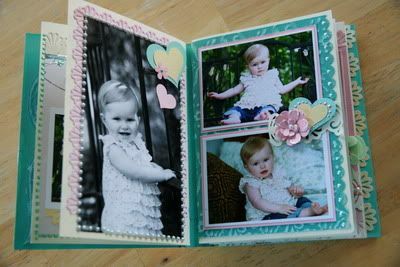 This is a class based on the popular column featured in every issue of Scrapbooks & Cards Today magazine. Students will start with the basics of building a layout and from there they will learn tips and tricks on how to take a page from good to great in class Vicki Boutin style! A few fun techniques will also be explored while completing three 12 x 12 layouts! Giveaways and good times will abound! It’s time to dig in and get your hands dirty! Together with Vicki, students will explore a plethora of fabulous techniques including tricks with fabric, a little resist, art medium ideas, tissue manipulation and more! Students will layer stamps, inks, mists, glitter and more. These wonderful techniques are going to be “dressed” up and displayed in a most interesting manner! If you are open to learning new things and having fun then this class is for you! Last but not least, I am excited to welcome Catherine Tachdigan- founder of Scrapbook & Cards Today Magazine. I am so excited for her to come to our fabulous city. She created the concept of this free magazine as a way to help stores thrive, to help the consumer learn, find inspiration and be able to seek inspiration without having to spend a huge cost. And especially in this modern day of recycling and saving pennies, it is AWESOME that wherever you are in this world; YOU can read the magazine (and all past issues) ONLINE for FREE. If you decide you would like a hard copy of it, you can get that from your local store (but be quick because they are free, they do disappear fast) or you can get a subscription where you ONLY pay for the shipping costs. You won't regret this choice, that's for sure! Scrapbook & Cards Today is pleased to announce its “Wonderful Winter” call.Scrapbook & Cards Today is a beautiful, seasonally inspired free publication that can be found in both Canadian and US independent scrapbook stores. 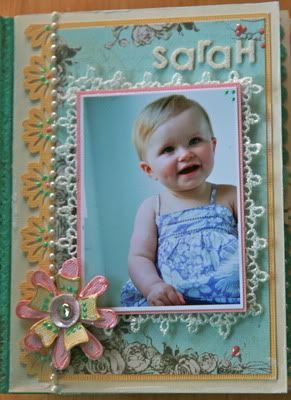 It can also be downloaded internationally, in its entirety and for free, by visiting www.scrapbookandcards.com. Becky Fleck’s sketches are always inspiring and this one is no exception. Download the sketch at http://www.scrapbookandcards.com/documents/SCT_dec_2011_sketch1_5x7_card.jpguse it to create a greeting card and then submit it to us for possible publication! Please put “winter sketch” in your email reference line. Are you perfectly organized or have you found a way that helps curb your messy ways? Share your tips and tricks with us so you can help others in the same situation. Photos as well as written submissions are welcome. We are always on the lookout for a “special” project to feature in our “something special” column. If you have created something outstanding, be sure to submit it for us to see. Be a part of the fastest growing scrapbook publication! 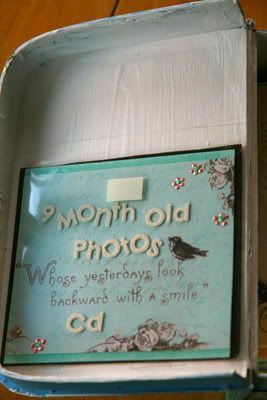 Submissions can be made at www.scrapbookandcards.com/submission1.html or atideas@scrapbookandcards.com. Compensation includes a fabulous goodie box from our sponsors plus two copies of Scrapbook & Cards Today! Please include your name, address, phone number, email address and supply list. Please ensure that all files sent are under 500KB. Summer CHA artwork and projects will be considered. This call ends October 3, 2011. We look forward to seeing your work! This call ends October 3rd, 2011. Our Crop & Create facebook page is INTERACTIVE! What does that mean? It is for absolutely ANYONE to become a part of. ANYONE can win, it is not just limited to those who are attending. Every Monday of Sept. we are posting challenges. 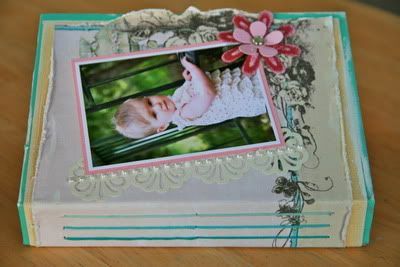 One card- by Kimber McGray and one layout (sketch created by Becky Fleck but a layout created by me). We would LOVE to see your work. We have lot's of prizes to giveaway!!!! All you have to do, is do a project or multiple projects. The more you enter, the more you win. then take a picture, and upload it to our facebook page for everyone to see. It's as easy peasy as that. Here is the card sketch! LOVE the sentiment. how funny! This crop is just where it's at. 2 nights of a luxurious late night snack- fri (chocoholic feast) and sat a dessert buffet. Friday night, 5 manufacturers have sent us up make n takes to do for FREE! THANKS!!!!! Also we have a special guest flying in fro the states to spend the weekend with us demo'ing a HUGE NEW PRODUCT!!!!! prepare to be excited! We are also pretty pumped to have 2 loca scrapbook stores onsite. Scrapbook Studio ( a brand new store) located on Primrose Drive, and Just Scrap It in Sutherland. They will be there to add to your cropping experience. Plus we might have one more guest from Stampin up! SUHWEET! Well today sure was a long post. so sorry, I just had so much goodness to share. Can't wait to see at the end of the month. woohoo! I am so pumped. This month is the big kick off to our first ever Crop & Create! It is taking place in Saskatoon. I am going to talk about Crop & Create on today's post,and even if you aren't attending please stay tuned. On the Crop & Create Facebook page we are hosting a couple challenges EVERY single week of September. These contests are open to EVERYONE. Not just those attending, everyone you know. So let's get started on how it works. Every Monday, we will announce a card sketch & a layout sketch on our CROP & CREATE facebook page and we will also announce the winners . We also may toss in other challenges in there. So you will have to stay tuned. We were given SOOOOO many prizes to give away and we want to spread the love from our super awesome Manufacturers that we think just rock! Here is the first layout challenge. 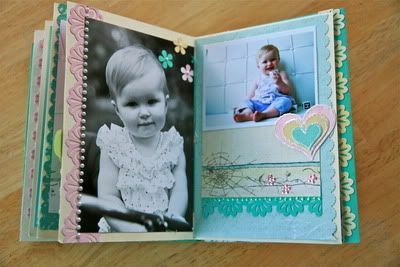 These layouts are brought to you by Scrapbook & Cards Today Magazine; created by Becky Fleck-author of Page Maps 1 & 2. This is MY take on this sketch. I ADORE this sketch so it is definitely going in my fave collection. Can be interpreted soooo many ways! Also for this first week you have another way to win. Simply send your friends to our facebook page and "like" us and make sure they say "----" sent me. You will also win a huge prize. This month we have sooooo many prizes, lot's to go around. So enter as many times as you would like. We are so blessed that our manufacturers think this event is such a great idea that they have rewally spoiled us, and anyone who might be interested in attending one day. Keep in mind, if you are from Saskatoon or area, we do have space available to still attend. The hotel has been super accomodating to us too. We sold out of a few classes so fast that we asked for more room, did a little shuffling and by acquiring a larger room we were able to open up our attendance to hold more people. So it's not too late to join us. Crop & Create is the first of a classy, creative event that will offer you many ways to have fun, and take classes. We pride ourselves that we have brought some of the best educators in our industry in. These ladies have travelled all over the world educating, and/ or have become authors. They will be on site to sign your books if you would like and they are looking forward to having fun with all of you! Our swag bag is something that is exclusive to us, not a loot bag that is a mismatch of older product thrown together in a bag given to you. This SWAG BAG has been prepared by Becky Fleck who has customized each and every bag so that you walk away with a fantastic surprise. It is the first of its kind in this industry to receive as a swag bag. The manufacturers LOVED our concept and jumped on the chance to sponsor it. We can't wait to see what you think of it. We are having a meet & greet, late night dessert bar, make n takes sponsored by major manufacturers and they are FREE to you!!!! Woohoo. We have a few contests that will take place. Some will be released next week so you can start preparing. We will send out all class supplies/tools needed for your classes next week. 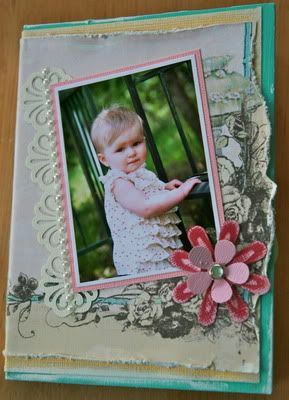 We have started putting out sneak peaks of classes on the Scrapbook & Cards Website. Please join us!!! Check back all this week for more updates on the crop! Make sure you hit our facebook page, it will definitely be worth your time. I am so proud of this event. The concept is brilliant of bringing amazing to local cities. Scrapbook & Cards Today has set an industry standard to constantly be there helping out the local stores and promoting manufacturers to bring EVERYONE knowledge & information that is free to you. You can find them ONLINE and see their magazine for FREE. Or if you are interested in a hard copy edition, you can get them free with purchase in participating scrapbook stores and last but not least. You can get them as a FREE subscription-you just pay the shipping cost. How awesome is that????? I like that they want to bring you the best quality in sketches to help you create, articles and substance that relates to what the manufacturers are releasing. Check them out today,you will NOT be disappointed. Then make sure you check out their blog & facebook page. They give out BRAND NEW product (not old stuff from years before) EVERY SINGLE FRIDAY!!!!! HAve you won yet???? I'm off to create fun and memories with my family today, how about you?